Duration: 6 - 8 hours. Description: This comprehensive tour covers all the major attractions of southwest Iceland, beginning with a drive to the national park and former parliament site at Thingvellir and continuing through the mountains to the area around the lake Laugarvatn, known for its high level of seismic activity. Next stop is Geysir, the world´s most famous hot spring, and Strokkur, its smaller neighbour, which erupts in spectacular gush of blue water every few minutes. The trip then continues to Gullfoss, the Queen of Icelandic waterfalls, returning to Reykjavík, via Skálholt, site of Iceland´s first episcopal see, founded in 1056, and the garden village of Hveragerði. 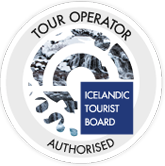 This comprehensive tour covers all the major attractions of southwest Iceland, beginning with a drive to the national park and former parliament site at Thingvellir and continuing through the mountains to the area around the lake Laugarvatn, known for its high level of seismic activity. 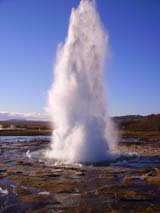 Next stop is Geysir, the world´s most famous hot spring, and Strokkur, its smaller neighbour, which erupts in spectacular gush of blue water every few minutes. The trip then continues to Gullfoss, the Queen of Icelandic waterfalls, returning to Reykjavík, via Skálholt, site of Iceland´s first episcopal see, founded in 1056, and the garden village of Hveragerði.